Ok, I cheated a little bit on this one. Sorry, but it's true. I'm not a southpaw. So the idea of me trying to swing a Nike Slingshot Hybrid is a dumb one. However, I have tried the *ahem* normal Slingshot Hybrids -- and while I usually favor Nike, I was not the biggest fan of this one. 30 degrees of loft are pretty good for a rescue wedge, especially when using it to "supplement" a harder-to-hit long iron. I have to admit that I haven't jumped into the whole hybrid craze yet -- I still hack at the ball with my 5 wood or 2 iron if I'm that far away (which is generally the case), but I golf with people who use them constantly. While you may really enjoy the idea of being able to come close to fairway wood distance with the feel of an iron -- this idea might be good for you. However, I recommend a different club. 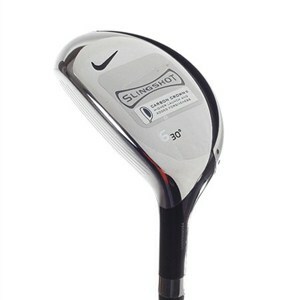 Price-wise, the Nike Slingshot series are generally pretty low -- but maybe spend the extra $30 and try the Taylormade Burner Rescue club which has a much better feel. While a little lower in degrees, this club has a much better feel, better shaft, and overall better impact point than the Nike.